If you are going to prepare an outdoor excursion in addition to having everything organized to spend a perfect day it is important that you have prepared games to do with the children. The traditional games besides being fun bring a series of benefits to your children, such as favoring sociability or learning behavior norms. 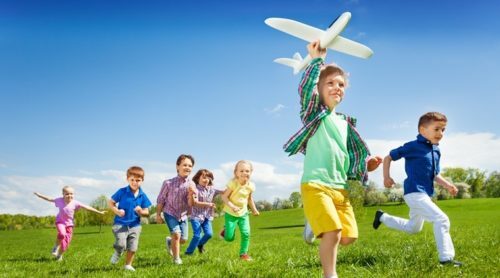 Take note of the ideas of outdoor activities for your kid that we propose. This activity will have a great time for children. In addition to having fun, the balance will be working and the children will learn behavioral norms. Have prepared some sacks and a whistle to give the time of departure. You can make a race between the children and another one between the parents so that they see you play, they will love it! 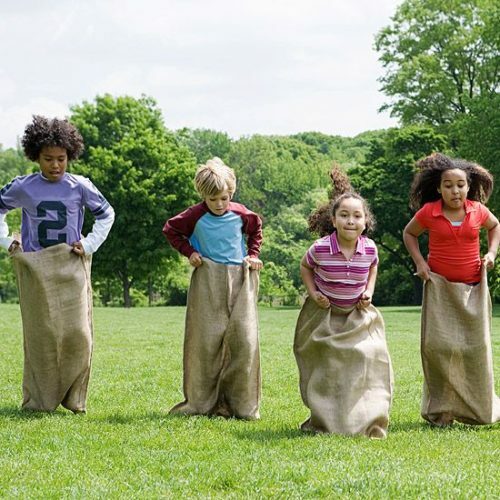 It is about putting everyone in a horizontal row inside the bags, when the time of departure the participants should try to reach the finish line jumping without falling. The first to reach the goal will be the winner. Water game is a great way to keep your baby fun with little budget. The amazing factor is that you can also play this game with the baby. All you have just need to buy a kid sprinkler to your backyard and you are ready to play these games. 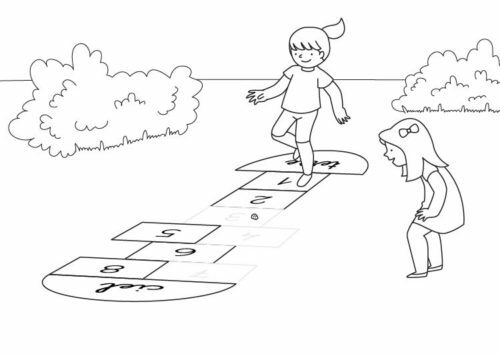 You can play this game if, in the place where you are, the type of floor allows you to draw ‘La Rayuela’, with its squares and numbers from 1 to 10. Each child in turn must throw his or her stone in the number touch him, starting with one to ten. For example, when you start, the stone is thrown, without leaving the square, at number one. To the leg take the player jumps the square of the number one and crosses the rest without stepping the stripes and without leaving, thus in each turn advancing until arriving at the ten. If, when jumping or throwing the stone, he steps on the streaks or leaves, he loses his turn. The winner will be the participant who goes through all the numbers before. This game is very fun and also encourages respect for the turns, balance and coordination is worked on, children learn to jump on the lame leg and review the numbers. This game you can do yourselves with plastic bottles, which you must fill with sand, and with a ball. With this activity, children learn to respect shifts and work on eye-hand coordination. The way to play is very simple, we recommend that you organize teams that mix parents and children. Each participant is placed on the line of distance that has been determined and has three attempts to make a full, that is, knock down all the pins at once. Each bolus that is knocked down is a point, in the case of making full you get 5 extra points and an additional roll. The team or participant who has scored the most points will be the winner. If the children are very small you can replace the egg with balls of material that is not very heavy or well, instead of carrying the spoon in the mouth they can carry it in the hand. With this game the children will be improving the balance, they favor the postural control, they learn behavior norms and the team work is encouraged. You will have to form two teams that will be placed in two Indian rows formed behind the starting line, so that they will compete in pairs with one person from each team. When the timeout occurs they must reach the finish line and then return to the exit to give the relief to another member of the team. If you lose the ball or the spoon in that journey, you must start the route again. The team that finishes before will be the winner. You can do a competition between children and another between parents, see them play and participate with them makes them very happy. Enable a small section of the room to mount the photo booth. Place a stool near the wall, which you will have to decorate with some wrapping paper or a cloth, which will be the background of the photographs. Put a box next to the stool with joke items, such as giant glasses, mustaches, bow ties or wigs. All participants must sit, individually or in a group, on the stool and disguise themselves with the first thing they catch from the box. A camera with a tripod would be ideal, to take all the photos with the same frame, changing only the participants. Then we can print the photos for guests to take home or assemble a video sequence with all the photographs. Every kid loves to look and hunt down hidden objects. This can be hiding candy, coins and others items that kids love to search for. 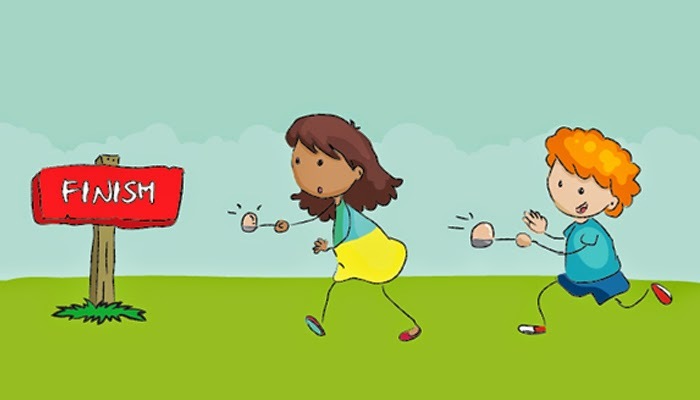 A fun way to spend a day of outdoor games with the family is to make games in which everyone can participate. Everyone should run with a glass (plastic or paper) full of water in their hand. The child who arrives before the finish line wins without spilling the liquid. To avoid misunderstandings, before leaving, it is advisable to mark the water level in the glass with a ballpoint pen. Training: two teams with the same number of participants. Two lines are drawn on the ground for each team. Behind them are the team members in a row, and on the other line of arrival, the candle and the match. Materials needed: 2 candles, 2 boxes of matches. 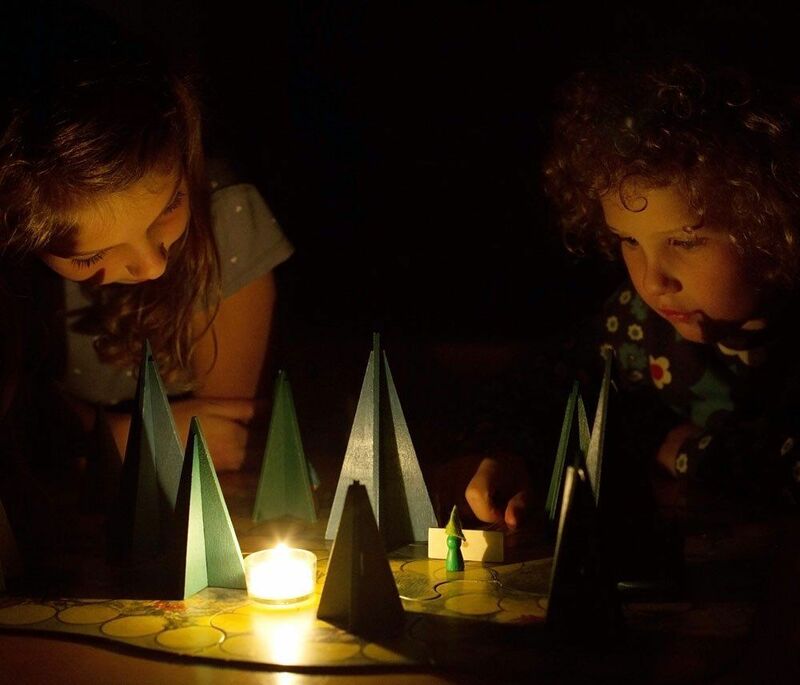 Development: at the signal to start, the first player of each team goes to the finish line, lights the candle and brings it to the second player. This takes it back, and turns it off when it reaches the line. Then he runs back and touches the third player in his hand. Then to the room. And so it goes on. As the players return from the finish line, they are taking place behind the row. The team whose first player steps first the starting line will be the winner. If during the course with the candle lit, it is turned off, the player must return to the line and turn it on again. Development: All the young people are placed in a circle, taking each other by the shoulders. Previously, each young man is told the name of two animals, but with the condition that no one else knows which animals touched him. One of the names will be “elephant”, and the second will be any other. For example: A young person will be “cat” and “elephant”. Another will be “Canary” and “Elephant”, and so on. When everyone is in a circle, the leader explains to them that they will say an animal name aloud and that the one with that name should be dropped. He will also explain that those on his right and left should take him by the shoulders and not drop him. If the player falls, he loses. If those on his right and left let him fall, they also lose. They do not necessarily have to leave the game, they can say a text, sing a song, etc. Once the leader has said the name of several animals and that the players have taken confidence, the leader shouts “elephant”. It is very funny to see how all the players fall at the same time! Development: We form two teams one on each side of the court. Each team will have a blanket and each member of the team should grab a part. The game is about each team can pass the ball from one side to the other but only touching the blanket, if the ball touches the floor is point for the opposing team. Materials: We need a volleyball court with its corresponding network.